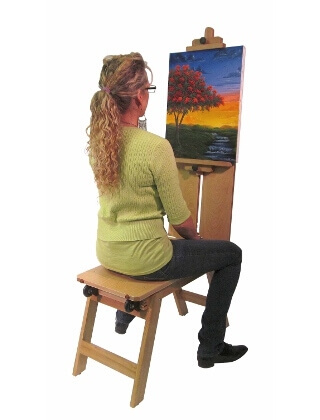 The Martin Wooden Bench Easel features Roller Board style function for traveling outdoors for painting, thin folded design makes it easy to fit in a trunk, closet or corner out of the way when not in use. Magnets keep all components together when folded. Elmwood in a beautiful elm finish. Folded dimensions: 30L14Wx4.5". Bench length: 24.75". Height: 18". Width: 13.75". Overall Product Assembled: 23"Wx37Dx71"H. Holds canvas size to 24".